Is this a feature of some sort? Due to Webkit perhaps? It even extends to the icon set which seem very subdued compared to 5.6. It isn't coloursync as far as I can tell. Changing that preference doesn't effect anything. Here are some sample screen shots of browsers side by side. OmniWeb on the left Firefox on the right. So are the colours on Omni's site. look at the blues in the logo. Last edited by belton; 2008-04-11 at 02:11 AM.. I just checked the OW page in 5.7... looks like your image on the right. Thanks for that, it must have been something specific to how OW ran on my system. Later I re-installed 5.6 and the colour renders as I would expect. Then I loaded up 5.7 to see the difference. It now renders correctly. ??? Although I got a brand new little quirk. 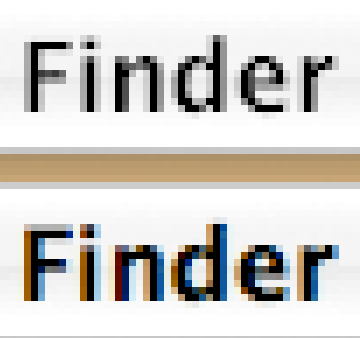 My menubars are rendering differently; globally, Finder, OmniWeb, FireFox, everywhere. I could see it spread through the applications presumably as the cache got called. Clearing the font caches didn't do anything by the way. Looking at screen shoots at 700% the "new" menus are all grey pixels whereas what I'd think of as standard ones have colour pixels in the mix leading to a bolder look at 100%. Does OW5.7 somehow change how things get rendered? Is that possible? Nothing is installed anywhere is there? Last edited by belton; 2008-04-11 at 08:42 AM..
Log out log in again, I guess all application menues should now look the same. This looks just like antialiasing settings changed while you installed and restarted OmniWeb. You may find that since OmniWeb can use ColorSync to correct colours of images on your Web page, images may appear different to those produced by browsers that do not colour-correct images, such as Firefox. Open OmniWeb's preferences, and select the "Appearance" category. Look for the "Use ColorSync" check box and clear it. If the images at the source do not have an embedded ICC input profile, then the colour data is processed using the system's default input and monitor profiles at the time the image gets rendered. You can try selecting a different monitor profile at the Displays system preferences to see if that affects the images shown in the Web page (and in other ColorSync-aware applications, including the Finder desktop). But because doing this affects your display system-wide, you probably won't achieve what you want by selecting a different monitor profile!